In Stock Now - Cosmic Radiation Terra Firma! For $25, you can get one. (I've got an order and I look forward to it shipping soon.) She comes with a bonus bag of parts, which sounds pretty cool - but what are they? I guess we'll know soon. Order yours here. If you've been keeping tabs on these, we've had glow, painted green, painted silver, black, and now blank red 12-inch Colossus Rex figures. They're $120 each and pre-orderable now. Are there more? Probably! Order yours now! The COLOSSUS REX 12″ GLOW IN THE DARK VINYL FIGURE is $120, and a few are left. (Yes I ordered one don't judge me.) The black version is also still available. Apparently, it doesn't stop - as of this post TheOuterSpaceMen.com Shop has unpainted 12-inch Colossus Rex figures up for grabs! (I'd collect them all, but at $120 a pop I'll probably stop at two flavors.) Click here to see what's available. Another Colossus Rex vinyl on Instagram! The black and silver figure has no specified name yet, but man it's gorgeous. Check it out below. Glow in the Dark Colossus Rex Sofubi Coming! What could be more suited to my tastes than a big space alien? One that glows in the dark! The Outer Space Men Instagram showed off an unpainted glowing figure - and it's pretty great. I must have one. Must you? Pre-orders, presumably, soon. 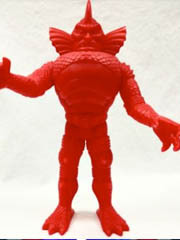 The Next Outer Space Men Sofubi - The Man from Uranus! On Instagram, we have confirmation that the second 12-inch vinyl figure for The Outer Space Men is Orbitron! There's no release date yet and I believe the preview photo is just a black and white shot of an existing figure, but that's still news! 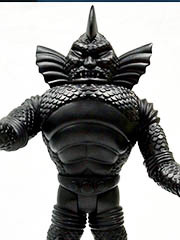 Six pre-orders remain for The Outer Space Men 12-inch Colossus Rex Sofubi figure. It's big - this comparison photo does a good job showing just how big. The rest will be sold at Five Points Festival later this month. The Outer Space Men - Now 12-Inch Sofubi Figure! Coming soon to Five Points Fest, this 12-inch Colossus Rex looks pretty gosh-darned stunning. (And yes I want one.) Take a gander! More info as we have it. It should be on sale June 2-3 at the convention in Brooklyn Expo Center.